Cook pasta directed on package, omitting salt and oil; drain. Meanwhile, spray 12-inch skillet with coating spray; heat over medium-high heat. Sprinkle chicken with salt and pepper. 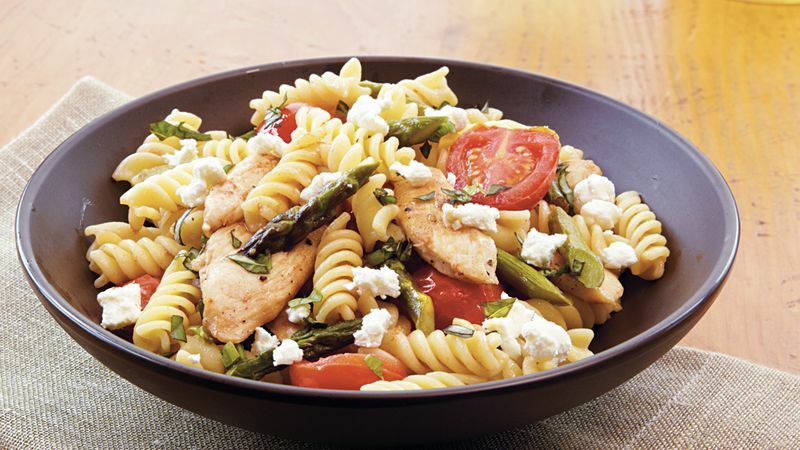 Add chicken and asparagus to skillet; cook 5 minutes, stirring frequently until chicken is no longer pink in center. Add tomatoes and garlic; cook and stir 1 minute longer. Remove from heat. Stir cooked pasta, basil, vinegar and oil into chicken mixture. Top with cheese.